In Obama's first public reaction to the violence, he says he is "deeply concerned"
(CNN) -- An audio message reportedly from al Qaeda's deputy chief vows revenge for Israel's air and ground assault on Gaza and calls the Jewish state's actions against Hamas militants "a gift" from U.S. President-elect Barack Obama. Al Qaeda's Ayman al-Zawahiri is said to address Muslims in Gaza in an audio message released Tuesday. The speaker, identified as Ayman al-Zawahiri, addresses Muslims in Gaza. He said the violence "is one part of a series of a crusade war against Islam and these air strikes are a gift from Obama before he takes office, and (Egyptian President) Hosni Mubarak, that traitor, is the main partner in your siege and killing." The message, posted Tuesday on various Islamist Web sites with a picture of al-Zawahiri next to an image of a wounded child, urges militants to rally against Israel. "My Muslim brothers and mujahedeens in Gaza and all over Palestine, with the help of God we are with you in the battle, we will direct our strikes against the crusader Jewish coalition wherever we can." The 10-minute message also address Muslims worldwide, claiming that Obama was portrayed as "the savior who will come and change American policy" during the U.S. election but is now "killing your brothers and sisters in Gaza without mercy or even pity." Obama's transition team did not immediately respond to the message. Earlier Tuesday, the president-elect said he was "deeply concerned" about the loss of life in Gaza and Israel, and he promised to make the issue a top priority in his administration. It was Obama's first public reaction to the ongoing fighting between Israel and Hamas militants in Gaza, which began with Israeli air strikes 11 days ago. He reiterated that only one president can speak for the United States at a time. "Starting at the beginning of our administration, we are going to engage effectively and consistently to try to resolve the conflicts that exist in the Middle East," Obama said. CNN Senior International Correspondent Nic Robertson said the al Qaeda message speaks to al-Zawahiri's cause in two ways: It bashes the new U.S. president before he takes office and it criticizes Mubarak, who has drawn al-Zawahiri's ire for not allowing goods and aid through Egypt's border with Gaza. 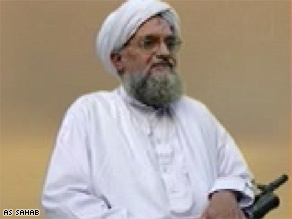 Al-Zawahiri is a native of Egypt who has served jail time there. Robertson, who is reporting from the Israeli-Gaza border, noted on CNN's "Situation Room" that al-Zawahiri got the message out quickly -- "within 12 days, that's very fast." He said that indicated "there's many issues there that are dear to him."